It was nearly harvest time, with the grape vines heavy with fruit. We drove into the Harney Lane Winery parking lot, choosing to park facing the vineyards and spent a few minutes just soaking in the view. 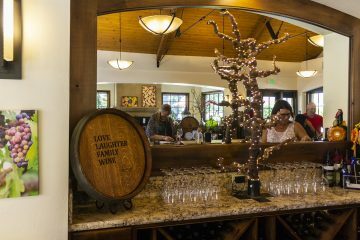 Once we were mentally prepared to savor the great-grandparents of the these grapes we walked into the tasting room chose an open spot along the bar. 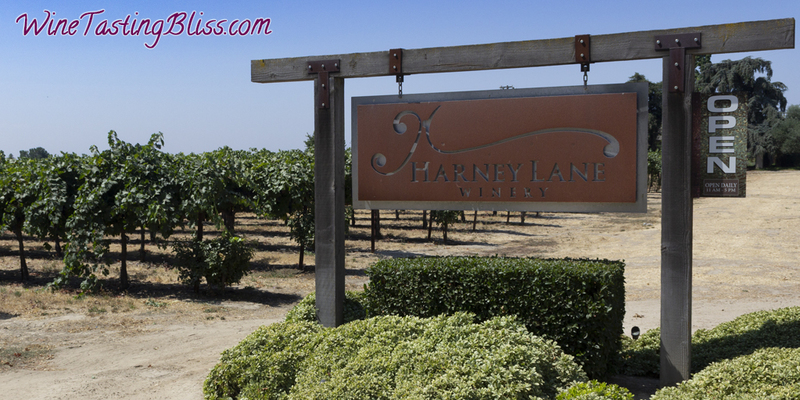 It was time to get reacquainted with the Harney Lane wines! We were greeted by wine guide Concetta, who set us up with wine glasses and got us started with their 2017 Albariño. 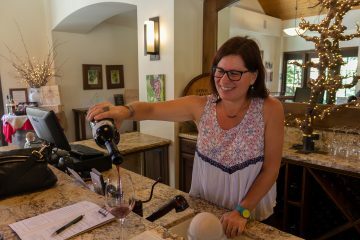 Concetta told us that this wine had undergone some “wild fermentation” where vineyard yeast kicks off the fermentation process immediately upon picking. Further, the winemaker chose to use some malolactic fermentation. 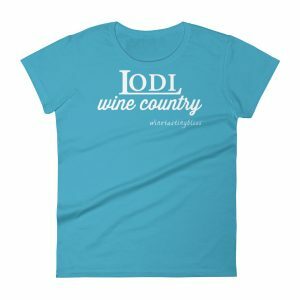 The resulting wine was bursting with notes of pink grapefruit and lime. Crisp and refreshing, it made us think back to the dog days of summer beside the pool. 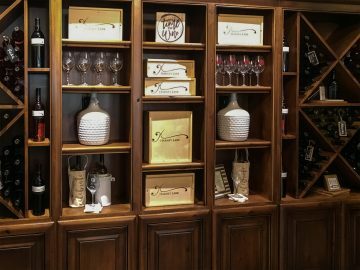 We learned that the Harney Lane Winery was celebrating their 10th anniversary! 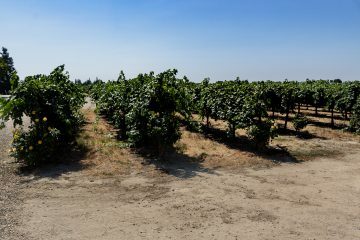 Five generations of farmers, now turned winemakers, have earned a reputation for consistently producing some of the best wine of the region. 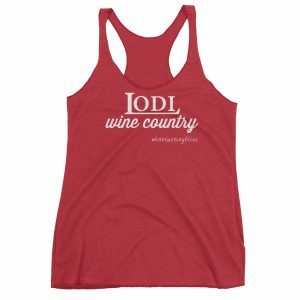 Although they still sell the majority of their grape crop to other wineries, all of their wine is made from estate grapes, with every step of the process done by hand. 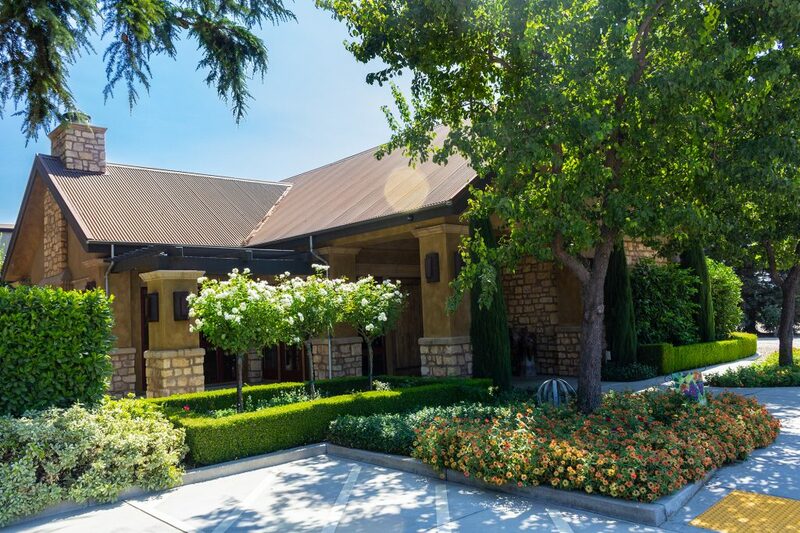 The winery also just won the USA Today’s 10 Best Reader’s Choice contest for Best Winery Tour. Next visit we really need to schedule ourselves into their Grape to Glass Tour! 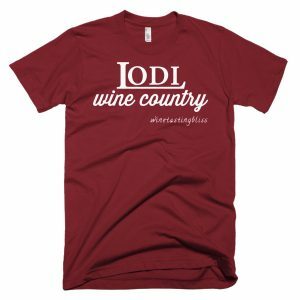 Their 2017 Dry Rosé was next, a blend of Tempranillo, Petite Sirah, and Old Vine Zinfandel. This was bright and cherry, bursting with Ranier cherry, citrus, and floral notes. Concetta then poured a real favorite: their 2015 Zinfandel. Only released last August, this is already drinking well, with dark cherry, chocolate, and coffee flavors delighting every tasters. Our Take Home list was started! The 2015 Old Vine Zinfandel (Double Gold winner in the 2018 SF Chronicle Wine Competition) blew us away with its blackberry, elderberry, and dark chocolate notes, with nice pepper on the finish. Wow! Another member of the Take Home list. We wrapped up our tasting flight with their 2015 Tempranillo. Aged in Hungarian and American oak, we loved the fruit forward, earthy notes, with enough tannins on the finish to stand up to any meal. The Take Home list took another beating. 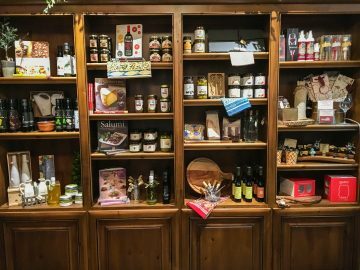 As Concetta was wrapping up our extended list of purchases, we wandered around the beautiful tasting room, examining some of the locally-produced products displayed in their merchandise nook. We stored our wine in our trunk cooler (never to wine tasting without one!) and returned to the tasting room to get glasses of wine to enjoy while we had a picnic lunch in their magnificently manicured garden area. After lunch, we thanked Concetta once again and set off for our next tasting in Lodi. Just a hint: bubbles are involved!